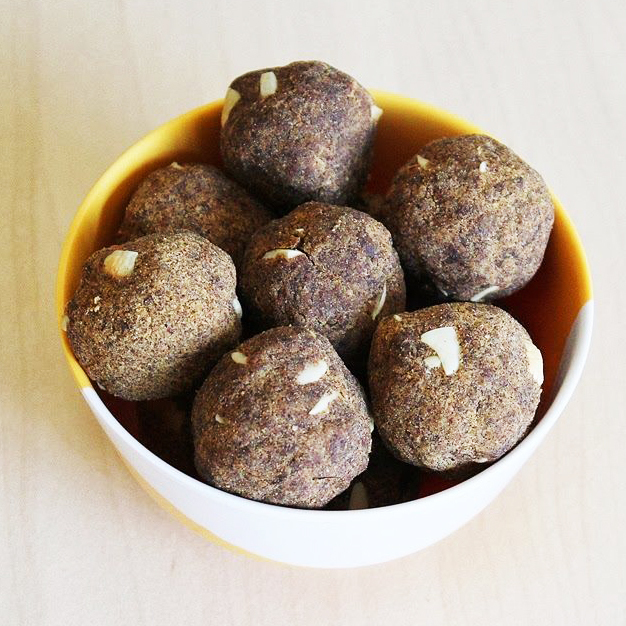 Note: What makes this Ladoos healthier is the ingredients used to make it. We know that multigrain intake has the ability to improve digestion, provide a more diverse mineral intake. The other healthy ingredient is the Jaggery instead of Sugar. Heat ghee in a heavy-bottomed pan and fry the multigrain flour lightly on a medium flame till golden brown. Melt jaggery with 1/4 cup water in a pan; filter and remove impurities. Pour the filtered mix back to the pan and add cardamom powder. Boil till it reaches a thick consistency. Leave it undisturbed for 20 seconds. Try to make a ball with the dropped mixture. If you can make a softball, then the syrup is ready. Switch off the flame. Mix the flour and syrup. Make sure there are no lumps. Add nuts and mix well. Grease your hands with ghee and make the balls while the mixture is still warm otherwise rolling the mix becomes difficult. Let the ladoos rest till cool. Cook In India is a one-stop solution for all your questions about good health, ayurvedic treatments, home remedies & related medicines. Cook In India is all about promoting Ayurveda, demystifying the concepts and theories behind it, and helping people to embrace it by simplifying its use. Find articles on natural health, home remedies, and alternative medicine.